The creation of sound is a very specific area of production requiring unique skills that can take time to learn through practise. Some people like myself take part in University courses to help get the skills and knowledge required to perform to the exacting standards required of the industry. I have a Masters Degree in Sound Design. I learnt many important skills and work practices and industry requirements doing that Masters, and it stood me in good stead entering the industry. But this industry is constantly evolving and there are many methods and techniques to achieve results on the varied productions in which we are involved. Finding ways to further yourself and your skills becomes very important. Last year I attended a workshop presented by Stephan Schütze of Sound Librarian on sound effects recording, It was enlightening to witness how much knowledge and experience can be shared in just one day if an experienced, knowledgeable and enthusiastic communicator takes you through their world. I am fairly experienced when it comes to recording sound effects, as it is a passion of mine, but I still learnt a number of things that had not occurred to me previously, many of which I went on to implement in my work. So this year, when I found out Sound Librarian was planning to do it again, I immediately signed up to lend a hand. Docklands Studios Sound Stage One in Melbourne is a spectacular location for this event. It is a massive film and television sound stage. It is huge, and acoustically treated to a minimum of 50dB(a) attenuation from outside sounds. Being in the space is great. There is still a fairly present reverberation tail, but due to the size of the space, there is a fairly long pre-delay before it reaches your ears, so often this could be removed from the recordings in post. For quiet sounds, it was not a discernable factor to the quality of the recordings. From arrows to cars, Stephan then took us through some techniques for micing up vehicle engines. He took us through where not to place the microphones (keep away from the exhaust pipes, but any air inlets should be fine), to using microphones that can handle the SPL’s of a car engine (DPA lapel mics are great). The most interesting and fun recording occurred when we used dry ice to make some incredible sounds. This involved a fair amount of experimentation, with advice from the crowd helping to guide the experiments. It was engaging and sounded incredible, with a wide range of sonic timbres. One of the shortcomings from last year was the lack of playback. There were times when the sounds being recorded were incredible – the sound of very close mic’ed layers of flat glass being slowly rubbed over each other was beautiful and intricate and captivating. I knew this because I was monitoring the recordings, but it could not be heard in all its close mic’ed glory by the crowd. This year was a different story. Sound Librarian had organised some large monitors for playback purposes, and periodically sounds were played back for the attendees. This proved especially useful for the fruit and vegetable destruction. Twisting and gouging of honey dew, lettuce, and capsicum was fairly unexciting as it was being performed, but hearing it played back over the monitors took the whole crowd into the grisly world of entrail manipulation, bone twisting, blood dripping, head crunching fun. Stephan talked about how often having layered vegetable such as leeks, lettuce, fennel root etc. works well for gouging and stabbing, due to the cellular close layers ripping apart separately. Also, when stabbing, don’t use a knife, as they go in too cleanly and don’t make a great sound. Using something old with some rust is better, such as an old chisel, or anything that isn’t too sharp. He then demonstrated some gouging techniques. Having the monitors there for playback between takes took this event to a whole new level. There was one part of this event that definitely didn’t require monitors. It involved a spectacle that I am sure will stay with me for a long time. This year, Stephan organised a theatrical armourer, Paul Norton of Port Fire Studios. He had with him a 44 Magnum revolver, a 9mm pistol, an Uzi 9mm submachine gun, a Lee Enfield 303 rifle and a pump action shotgun, all modified to fire blank rounds. 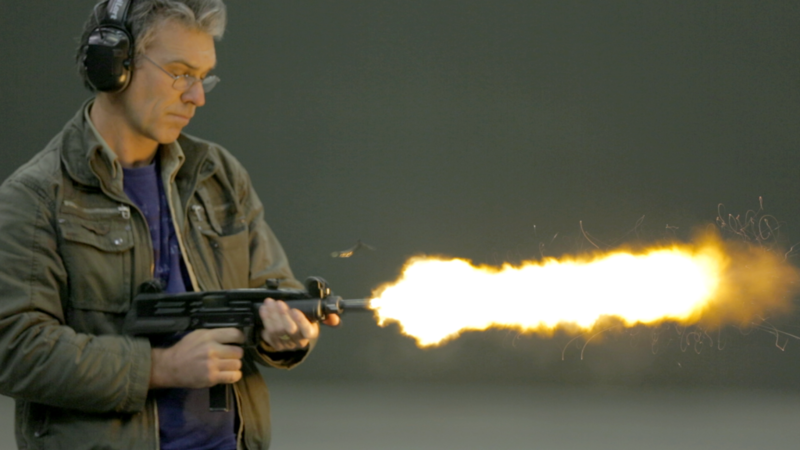 These weapons may have been firing blank rounds, but they sounded incredible. Paul Norton was very experienced and generous with his knowledge. He covered the many safety procedures that would be required on a film set, such as always showing the empty barrel to the first AP before loading, then after the action, showing the first AP the empty weapon again. Never aiming the weapon at another person ever, not empty or loaded. Even during filming a two shot, they cheat angles so the weapons are never pointed directly at another actor. And then we got to hear these weapons! First everyone was offered plenty of opportunities to collect ear protection. A large tub of ear plugs were passed around. Everyone was given plenty of notice before the weapons were fired, then BLAM! Wow. The firing certainly excited the reverberation of the space! It sounded incredible. The highlight for many was the final weapon, the shotgun. It had a massive BOOM to it, which hit me in the solar plexus, and a decay that rocked around the space for a significant time. While this was pretty exciting, the weapon that felt the most crazy, that sent the hairs on the back of my neck tingling, was the Uzi. Sheesh. The burst mode that weapon kicked out was a thud thud thud to the chest. Surprisingly I felt it most in my legs. And the image of a man holding a large gun in one hand, with flames spitting out the barrel with that incredible noise will be seared in my brain for some time. The noise and excitement of the weapons was spectacular, and the session was very informative, but I think the most useful session came first thing in the morning. It was a session on destruction, but focused on building blocks. In it, Stephan talked about the elements of destruction, such as car explosions, house explosions, and what makes the good ones so incredible. He mentioned something he read in David Yewdall’s book, The Practical Art of Motion Picture Sound, in which he says the most important part of an explosion is the debris. Getting the sound of the initial gas expansion boom shouldn’t be too difficult. What makes it sound incredible is how the debris is placed, and what debris is chosen, and how those building blocks are manipulated. To demonstrate this he set up three bricks on the concrete slab floor, and gently pushed them over. He did this again, demonstrating the infinite variability you can get recording and performing this yourself. This could be a small wall collapsing. Layered it could be a mid sized wall collapsing. Layered with the elements time shifted it could be a large wall collapsing. Layered and time shifted and some of the same elements pitched down it could be a giant fort and all its surrounding walls crumbling to the ground. He then demonstrated the same thing, three bricks, falling on a wood surface. Suddenly you have the same debris for a whole new scenario. The next debris element he demonstrated was the bag of junk trick. Fill a soft bag like a recycled cloth supermarket bag, or a light cotton bag, with your debris elements. They could be metal objects such as small plumbing pipe offcuts, and metal utensils, some bits of wood, maybe plastic. Now empty the bag onto your surface and record the results. Instant debris. You can tune the results by taking out anything that didn’t sound good, and adding other elements until the composition of sounds is right, and record away. Such a simple and obvious trick, but one I had not thought of before. Thinking in terms of building blocks – recording different building blocks for different needs, and layering and timing them just right, was great advice. It demonstrated how you don’t need expensive explosion libraries to make great sounding explosions, you just need to record a large variety of debris falling, and always think about how elements can be manipulated with timing, and with pitch and to change their weight. It also made us think about using these techniques editing other audio elements for a production. As with the first incarnation of the workshop, this year we used the opportunity of being in a massive soundstage, and having around a hundred people milling about, to demonstrate recording crowd sounds. Stephan talked about Walla recording, how less is often more, try not to have anyone sticking out in the mix too much. There was a quad mic setup that was used to record some of this general walla, and some great walk-bys were recorded. To spice things up a little, they were done zombie style. The walking dead crowd dragged themselves past the mics, slowly. A few takes, one in silence, which I bet would prove incredibly useful in a number of situations, and a few takes with increasing levels of undead vocalizations as they passed by the mics. It was great to be a part of this jostling crowd recordings, and was good to get some experience of the level of sameness needed to make a recording of this type bed down well in a mix. Last year’s event was a huge success, but I think this year surpassed it. The updates to the format such as monitors to allow the audience to hear the quiet sounds shortly after they were performed was great. I am sure next year will be even more special. Pulling an event like this off, bringing together so many like minded, interested, and passionate people into the same space to learn and share knowledge made it a great event, and one in which I am happy to have been a part. Congratulations to the entire Sound Librarian Team. Anna who was indefatigable with the preparations, camera work on the day, and pulling down the show, to Stephan who was so generous with his time and expertise and who encouraged everyone to share their own experiences and pro tips, and to the volunteers who I had the pleasure of working with and who made the event run smoothly and stress free. I already look forward to next years workshop, it is a rare gem, one that makes furthering anyones skills in the audio industry a thoroughly rewarding and entertaining experience. Special thanks to Michael Theiler for contributing this article.